For the 2016 film, see Transpecos (film). The Trans-Pecos, as originally defined in 1887 by the Texas geologist Robert T. Hill, is the portion of Texas that lies west of the Pecos River. 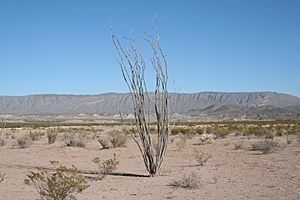 The term is considered synonymous with "Far West Texas", a subdivision of West Texas. The Trans-Pecos is part of the Chihuahuan Desert, the largest desert in North America. It is the most mountainous and arid portion of the state, and most of its area (outside the city of El Paso) is vast and sparsely populated, comprising seven of the ten largest counties by area in Texas. The area is well known for the natural beauty of the Big Bend and the gorge of the Rio Grande, part of which has been designated a National Wild and Scenic Rivers System. With the notable exceptions of Big Bend Ranch State Park and Big Bend National Park, the vast majority of the Trans-Pecos region consists of privately owned ranchland. The vast majority of the region's population reside in the El Paso metropolitan area. The Trans-Pecos region consists of nine counties: Brewster, Culberson, El Paso, Hudspeth, Jeff Davis, Pecos, Presidio, Reeves, and Terrell (See table below). 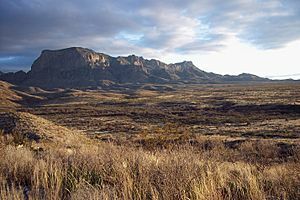 Brewster County, the largest, has a land area of 6,193 sq mi (16,040 km2). To put this figure in perspective, the land area of Brewster County is about 10% larger than the entire state of Connecticut, yet it has a population density of only 1.4 persons per square mile compared to the 723 persons per square mile who reside in Connecticut. However, Brewster County is not the least-populated of the nine counties that comprise the Trans-Pecos. Terrell County, which borders both the Pecos River and the Rio Grande, is the least-populated county in the Trans-Pecos region. According to the United States Census of 2000, Terrell County had a total population of 984 residents occupying a land area of 2,358 sq mi (6,107 km2), resulting in a population density less than 0.5 persons per square mile. 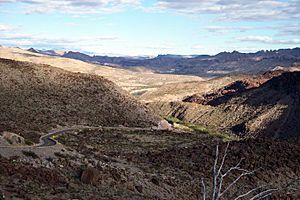 The Trans-Pecos is a region of extremes, and at the opposite extreme from sparsely populated Terrell County is El Paso County, which is the smallest but most populated of the nine counties. El Paso County has a land area of only 1,015 sq mi (2,629 km2), yet it has a population of 800,647 individuals, resulting in a population density of 789 persons per square mile, a value that exceeds that of Connecticut. Overall, the total population of the Trans-Pecos amounts to 856,187 residents occupying an area of 31,479 sq mi (81,530 km2), resulting in a population density around 27 persons per square mile (10 persons per km2), less than a third of the population density of the state as a whole. Politically, the Trans-Pecos has more in common with New Mexico and the Colorado Plateau than with any other part of Texas, being more competitive than either the extremely conservative heartland of Texas or the ancient Democratic stronghold in South Texas proper. Of its nine counties, Presidio is the most consistently Democratic, being like South Texas the longest-established Democratic stronghold in the nation. El Paso has also been solidly Democratic since Ronald Reagan won the county in 1984. Jeff Davis is the most Republican county in the region, last being won for the Democratic Party by Jimmy Carter in 1976, although even George Bush junior’s 66.79 percent of the vote in 2000 stands modest compared to the 90 percent or more Republican vote common in Panhandle counties since the turn of the millennium. Hudspeth, Pecos and Terrell Counties, last won for the Democrats by Bill Clinton in 1996, have become comparably Republican to Jeff Davis in the past couple of elections. The remaining three counties, especially Brewster County, have been “swing” counties since the 1970s, although Hillary Clinton consolidated Democratic majorities in Culbertson and Reeves counties in 2016. The city of El Paso and its environs form Texas's 16th congressional district, currently represented by Congressman Beto O'Rourke (D-El Paso). The remainder of the region is located entirely within Texas's 23rd congressional district, currently represented by Congressman Will Hurd (R-Helotes). In the Texas Senate, El Paso County forms a single district, Senate District 29, represented by José R. Rodríguez (D-El Paso), while the remainder of the region is included in Senate District 19, represented by Carlos I. Uresti (D-San Antonio). In the Texas House of Representatives, El Paso County is divided between House Districts 75-79, while the remainder of the region is included in House District 74. Interstates 10 and 20 are the largest freeways in the Trans-Pecos region. Major federal highways include US Highway 90 and US Highway 67, which are partially cosigned; Highway 90 continues from Alpine east to Del Rio, while Highway 67 runs south from Marfa to the Mexico-United States border at Presidio/Ojinaga, after which it continues as Mexican Federal Highway 16. State Highway 17 begins in Pecos and traverses Balmorhea State Park before joining Route 67 in Marfa, while State Highway 118 begins shortly after the junction of Interstates 10 and 20 near Kent and continues south to Study Butte at the entrance of Big Bend National Park. Trans-Pecos Facts for Kids. Kiddle Encyclopedia.